Lalique Villa. This is simply a ‘stunning’ home!! How many other homes can boast to have their own private lake? 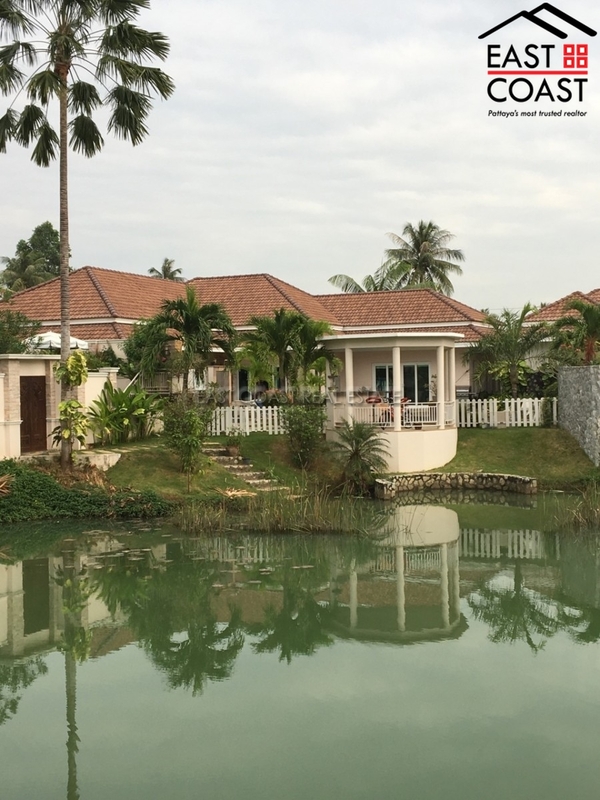 Located in Huay Yai, this very rare European private pool home is mouth-wateringly good!! Set upon a raised embankment it enjoys some fantastic infinity views, and has a nice breeze coming off the water. There are just 4 homes surrounding this private lake, and each faces inwards to the centre of the lake, which means that no house is looking onto another one, so there is complete privacy. Inside, the house is a very modern design allowing for maximum views of the lake, private pool and large patio area, with aan airy open plan living area, aside the fitted Western kitchen, and all the bedrooms being generous in size and each with its own en-suite bathroom. With so many “special’ feature, this home really needs to be viewed to be understood. From its concealed bathroom, with bathtub in the master bedroom, the laundry facilities hidden behind the kitchen, the elevated patio atop the carpark offering maximum views….the list goes on. Outside, the garden and patio all wrap the private swimming pool, and beyond this, right on the edge of the embankment is your own private bar. This completely unique house is also for sale fully furnished, and fully air conditioned. The title deed is currently owned within a Thai Company, however must be transferred out, and as such, the seller accepts to split the taxes and transfer fees on a 50/50 basis.